Me and Parker are official Konfidence swimologists. Konfidence is an amazing swimwear range for babies and children. 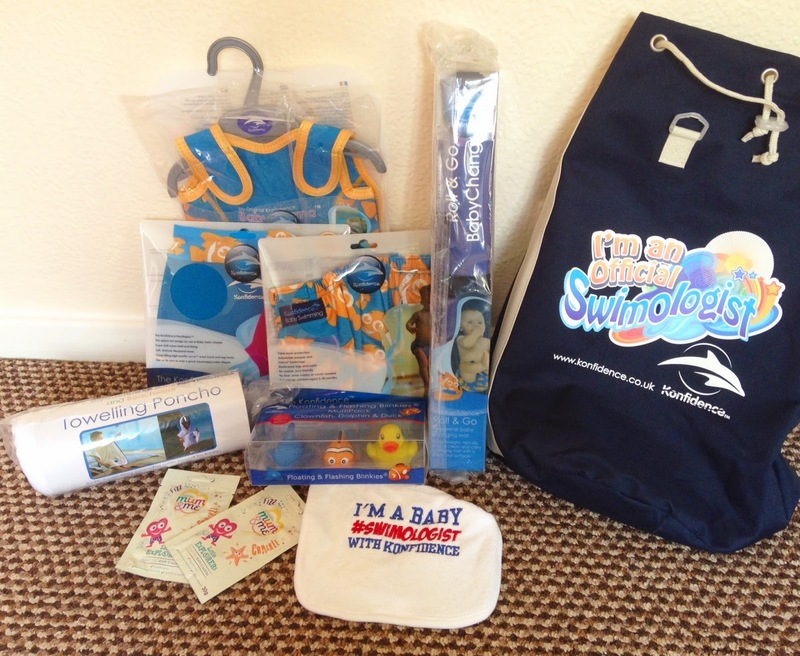 They sell an amazing range of products to help children feel confident and be safe in water. It was originally started by Andy and Caroline and is still a family run business. When we were first asked to be swimologists I was over the moon. When Paige was younger we always wanted to take her to swimming lessons but it was always something that got pushed to the side, can you believe that at almost 3 she still has never been swimming?!! That will be changing very soon! Mark isn't a very confident swimmer so it would be up to me. I know she will love it when we do go and I can't wait. Parker is 9 months old and through Konfidence we will be starting baby swimming lessons in May. I am so excited and can't wait. Along with the swimming lessons we also get to try out a variety of Konfidence products. I can't wait to share Parker's swimming journey and what we think of the products. I am a little nervous but he is a water baby at heart and loves the bath so I'm hoping that he will love the lessons. It also means that I have to brave and wear swimwear which I haven't done in years! I also have a £50 voucher to giveaway for one luck reader to win. All you have to do is fill out the Rafflecopter form below. The Babywarma wetsuits are fantastic. We have the navy & red polka dot one and as well as looking fantastic it keeps my daughter warm all lesson. I like the Shorties Wetsuits, thanks. I love the babywarma baby wetsuits! The shortie wetsuits are great! I would love to win these for my little boy. The Shorties Wetsuits look great. I love the Konfidence Jackets. My little man is nearly 3 and loves the water but this would just help him feel a lot safer, me too! I love the Konfidence Jackets. My nieces should be able to swim by now, but they haven't been taught. It's going to be difficult teaching them now they've started living with my mum, because she's a poor swimmer and I'm too far away to teach them regularly. So I'm sure this would boost their confidence. the shortie wetsuits are FAB! It has to be the Babywarma Baby Wetsuit - brilliant for our babies! The little wetsuits. Thank you! The Quickfins Dolphin Suit is way too cute!! babywarma wetsuits looks good for the outdoor pool in iceland.